Embarking on a tiki quest can be one long series of disappointments. You come across a recipe in Grog Log or Sippin’ Safari , it sounds fantastic, you set out to make it and — dammit! you have no guava nectar. No problem — there’s this recipe a few pages further, it sounded good last time you looked at it, but — hold on, you needed to start working on the syrup for this three days ago. So you flip around in the book some more, find something else that seems like a drink you absolutely must make right this very minute, but — Jesus! who ate the goddamn grapefruit! I first read this recipe around nine months ago, when I was working on an article about the Bum for last May’s issue of Imbibe, and I managed to wheedle a few Sippin’ Safari drink recipes out of him in advance so I could break out the booze and start working on a few of Donn’s rum rhapsodies without having to wait for the book to hit the shelves. 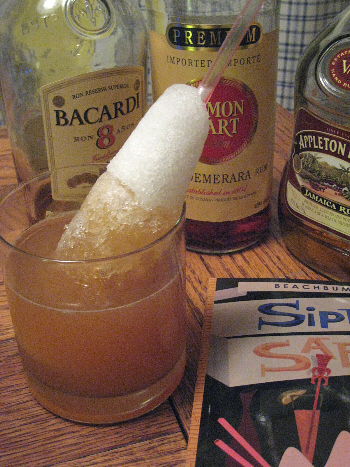 I even ran this recipe in the story, but the thing is — I never made the drink. Not because the list of ingredients calls for anything that distinctive, but rather, it was the drink’s finishing touch that kept me away. I regret to say I’ve been mixing out of Jeff’s books for about two years now, but I haven’t tried my hand at an ice cone until tonight (or, last night really — since it’s another of the damn things you have to start planning for in advance). But, I finally broke down and bought an ice shaver — perfect timing, what with summer crapping out on us early up here in the Pacific Northwest — so between me and Mr. Snowman , we’re ready to take a crack at the Luau Grog. Put everything in a blender (ice last); blend at high for no more than 5 seconds, and pour into a double old-fashioned glass. Serve with ice cone**. * honey mix – equal parts honey and hot water, stirred until honey is dissolved, and allowed to cool to room temperature. ** ice cone — shave a heap of ice, and pack it into a pilsner glass. Run a chopstick down the middle to make a hole for your straw, and freeze overnight. Very, very similar to the Navy Grog, the Luau Grog has a lovely balance among the rums, with the honey and the grapefruit pulling in different but complementary directions. And while it’s mainly for appearance, the ice cone really is a nice touch — it gives one last little burst of chill to each sip of the drink, and it’s a refreshing step away from the mundane of the everyday. Which, when you come right down to it, is kinda what tiki is all about. There must be grog in the weather. I just made two of the suckers yesterday (luau and navy) for tasting purposes. Thanks for the link to Mr. Snowman. Now the only thing stopping me from making those cones is a serious lack of freezer space. Question – would finely crushed ice be suitable for cone construction? Am wondering if it has to be finely shaved to get the packing done. Thanks for any advice! Shaved ice has the consistency of snow, so you can really get it to pack together in the glass; fine crushed ice just doesn’t hold together as well. Paul, that first paragraph sums up my own nightly frustration perfectly. The solution: start drinking around noon, when there’s still time to stagger to the store! Paul, how did you shave your ice? This looks so good. The summer humidity is kicking in here in Brooklyn. Something like this sounds like it would perfect. Now, I just need a small island and a hammock to go with it.